Setting up proper style sheets using InDesign styles is a great way to start any project. Where do you start? How about we start at the beginning. Before setting up your style sheet, figure out which style sheet you should use. Here is a quick overview of the five styles in InDesign plus an infographic on character styles vs. paragraph styles to help out with two of the most popular style options. An Object Style is simply used to standardize formatting for shapes and frames. You can use an Object Style to apply options such as: drop shadow, bevel, frame options and text wrap. Object styles will not adjust the size of the object; but it can apply the fitting option so you can “adjust” the size of the media inside the object. You can also apply a Paragraph Style to the Object Style. The Table Style is obviously used for tables. It standardizes formatting like: row and column strokes, alternating fills and table spacing. You can use a cell style to adjust the text where a table style doesn’t. You can apply a Paragraph Style to a Cell Style. The Cell Style standardizes feature like: cell insets, and text alignment. 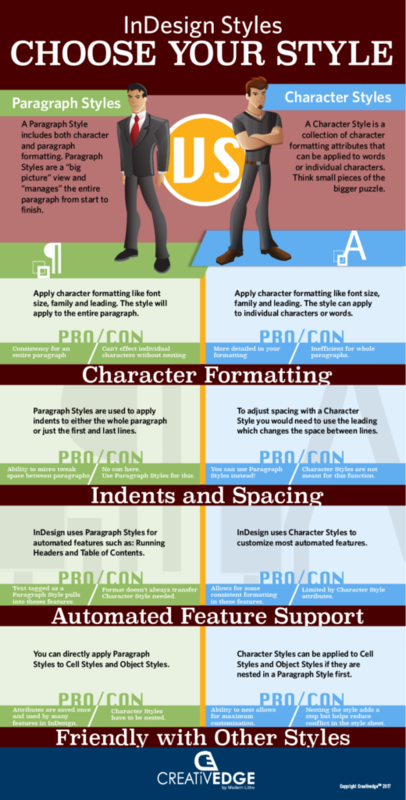 A Character Style is a collection of character formatting that can be applied to words or individual characters. You can apply and standardize font types and sizes even setup HTML tagging. A Paragraph Style includes Character Style attributes plus paragraph level formatting. Basically you have all the power of the Character Style plus spacing and indents, tabs, column spanning and GREP Styling. You can also nest a Character Style inside a Paragraph Style to give you even more control over your text. Half the battle is knowing where to start. So, pick your style and set up those sheets. You will thank yourself later.